The Annenberg Auditorium is very small, but the producer, Dustin George-Miller is putting on an interesting concert series and the museum that houses the hall has some very fine Native American masks, costumes and pottery. 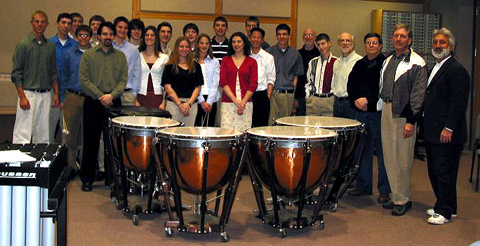 At three o’clock on the afternoon of our concert, we gave a master class for the Penn High School Percusion Ensemble from Mishawaka, Indiana directed by Murray Weaver. 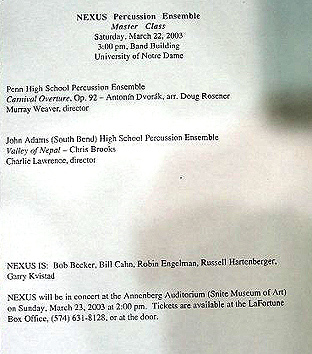 They played the Dvorak Carnival Overture in an arrangement by Doug Rosener, edited by Bob Schietroma. In a situation like this, there are lots of things to discuss and we discussed them. Those in Nexus who had played the work in orchestras, had that sound in mind and further, the delicate issue of doublings and instrumentation came under close scrutiny. The next group was from John Adams High School in South Bend and under the direction of Charlie Lawrence, they played “Valley of Nepal” by Chris Brooks. 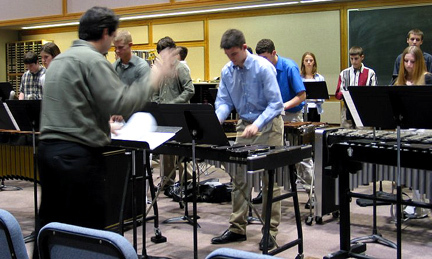 Both pieces give a large number of percussion students an opportunity to play and both are exciting and involving. All the students were into it. The last time we had adjudicated ensembles this large was in Baylor,Texas. 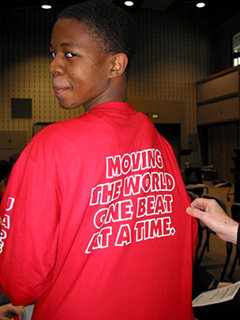 Personally, I’m nominating the kid in the “Moving the World One Beat at a Time” T – shirt for Time Magazine’s “Man of the Year” cover.